Touch Command EVO | C Marshall Fabrication Machinery, Inc.
MG is very proud to introduce the Touch Command EVO – the latest version of their popular CNC system completely designed and flawlessly integrated with MG machines through years of research and development. The control retains its easy to use interface on the surface of previous controls that our customers have enjoyed; however, underneath it there is an all new extremely powerful engine which delivers a precision of control never before found on a plate rolling machine. This is mainly achieved by the new closed loop system which constantly monitors the rotation and side roll positions. There are some unique challenges when it comes to designing a true CNC control for a plate rolling machine. The main challenge is the difference in yield tolerances of the material being rolled. Company A is receiving material that is 38,000 psi from a supplier in the Northwest and company B is receiving material from a different supplier in the Midwest that is 45,000 psi. If these two plates are rolled on the same machine using the same settings they will roll to different diameters due to the different yields even though they are both A516 gr70 plates. There is not a CNC control available that can take these differences into account and automatically adjust for them without some operator intervention. MG has taken the unique approach of designing a material library that can be adjusted to work specifically with the material you are receiving. This is done by making 3 test bends with your specific material and inputting the diameters that were actually achieved. Once this is done and the computer understands how your material reacts or springs back, it can accurately auto-generate programs of virtually any shape required with the material you adjusted the library for – round, square, triangle, elliptical, etc. If you do happen to buy material that has a slightly different yield than normally you can use the powerful corrections page which gives you the ability to adjust any section of the part you are rolling independently. The transitions on parts with more than one diameter are flawless due to the all new closed loop system that was designed to check for the correct side roll position every 0.039 inches of rotation. If the side rolls starts to deviate from the correct position during a transition the rotation will speed up or slow down automatically to ensure the transition is correct. This is crucial when rolling parts with changing diameters. There is also a completely new CAD system included which allows you to draw shapes to be rolled right on the control or if you prefer you can upload a DXF file. After your shape is loaded just choose your material and the computer will generate a program to roll your part. The number of steps in a program along with how many programs can be stored are virtually unlimited. The touch screen is easy to navigate and can be used while wearing gloves. Programs can be backed up via USB keys for easy offline storage. 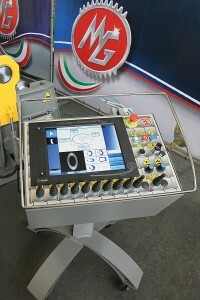 The CNC Touch Command EVO is the most user friendly and accurate rolling sytem ever produced for a plate roll. Thanks to the above-described closed loop system the material waste has been virtually eliminated. When choosing a 4 roll machine with a CNC control there really is no better choice than the Touch Command EVO.